Fiordland and its surrounds are a hunter’s paradise, and being one of a very small number of operators with concessions to land in the National Park, Fiordland Helicopters can take you to the animals. 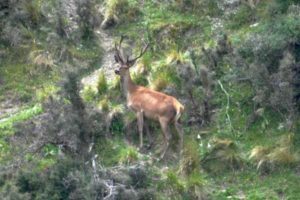 Clients travel from all over NZ and the world to hunt red deer, wapiti, thar and chamois in the Fiordland area. We operate Hughes 500s and AS350 Squirrels. We provide safe, efficient access into the Wapiti blocks and have been flying in Fiordland for over 30 years. Our pilots are keen hunters themselves and they are happy to share their local knowledge to make your trip as successful as possible. Please contact us as soon as possible for information on landing spots, camping sites, accessibility, etc., and for specific pricing for your hunting party plans. Please note: It is important that all hunters read our Terms & Conditions before commencing a trip with Fiordland Helicopters.